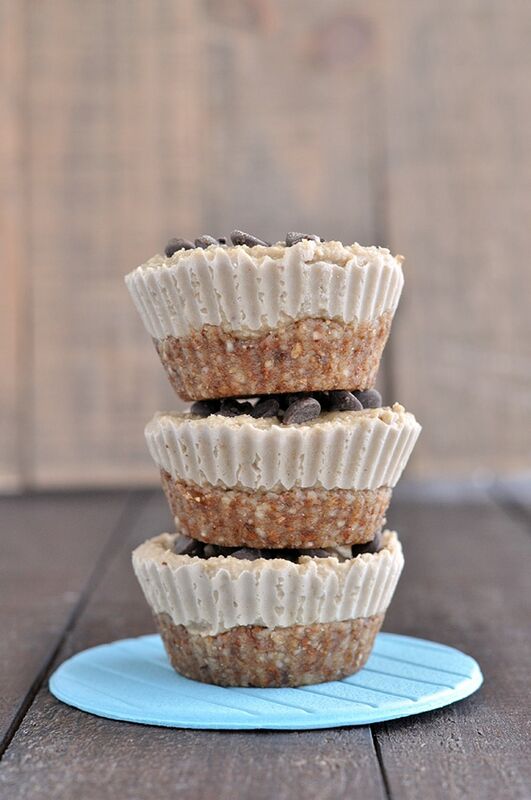 These Coffee Protein Cheesecake Bites make a healthy dessert with benefits. I don’t know about you, but I am in love with all things coffee flavored. 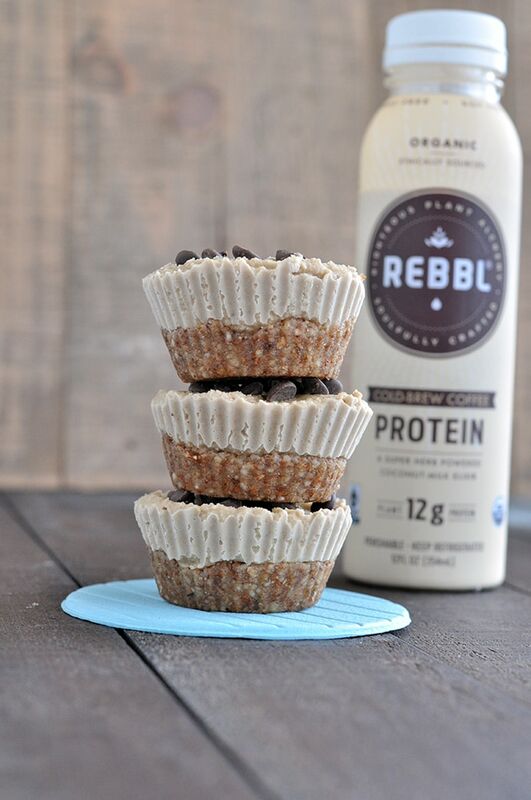 I used REBBL’s new Cold-Brew Coffee Protein coconut milk elixir to make this healthy dessert. They have 3 new delicious flavors now. You can see them below. 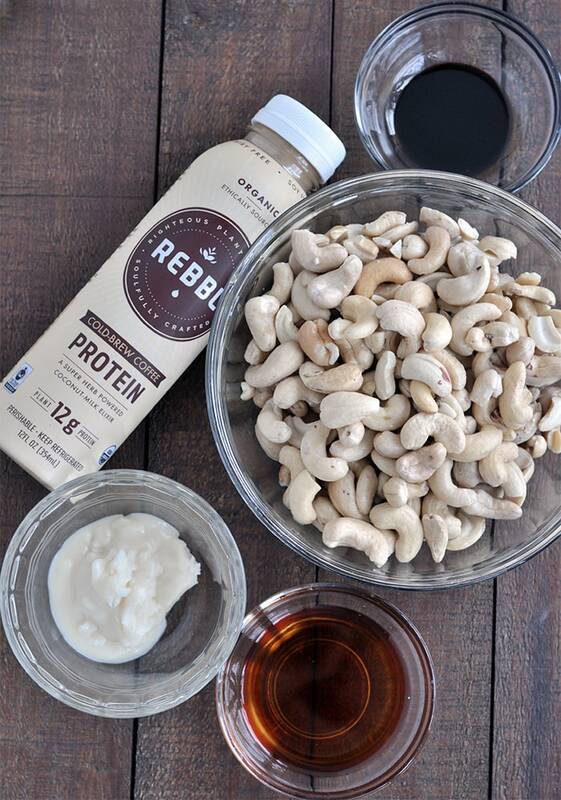 While most protein drinks use processed ingredients, REBBL’s protein elixirs use protein sourced from peas and sunflower. I love that. All the ingredients are real, organic, fair trade, and gluten free. So this is a dessert you can feel good about eating. I actually found myself snacking on them after my workout the other day. I had just come home after a great workout. Of course a mom never gets a break and I’m sure you could relate. My kids wanted lunch, and my husband needed some help too, not to mention I was starving! These little snacks came to the rescue. With it’s protein, healthy fats, it was a great post-workout treat. I ate one of these and dove back into life. It was a really satisfying snack. Each bottle of Cold-Brew protein contains 12 grams of protein, healthy fats and super herbs: maca, reishi, and ashwaganda. The maca is great post workout because it enhances energy levels and the ashwaganda is great post workout since it helps with quick recovery. Maca: Used to support healthy energy levels, stamina & endurance, and healthy hormone balance. Reishi: Used to support liver protection & detoxification, cardiovascular health, and healthy aging. Ashwaganda: Used to support sustained physical endurance, improves cognitive function, quick recovery and enhanced relaxation. Another great thing about REBBL is that they donate 2.5% of revenue to Not For Sale to support regions of the world which are vulnerable to exploitation and human trafficking. So each time you buy a bottle or REBBL, you are helping to take a stand against this issue. 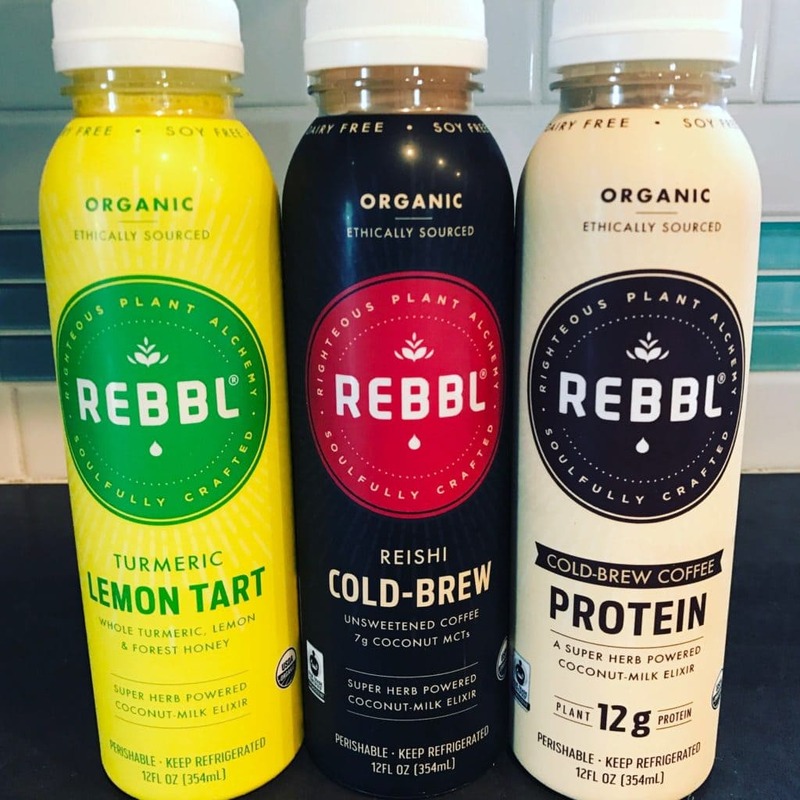 To find where to buy REBBL in stores near you, click here. You can also follow them on Facebook, Instagram, and Twitter. 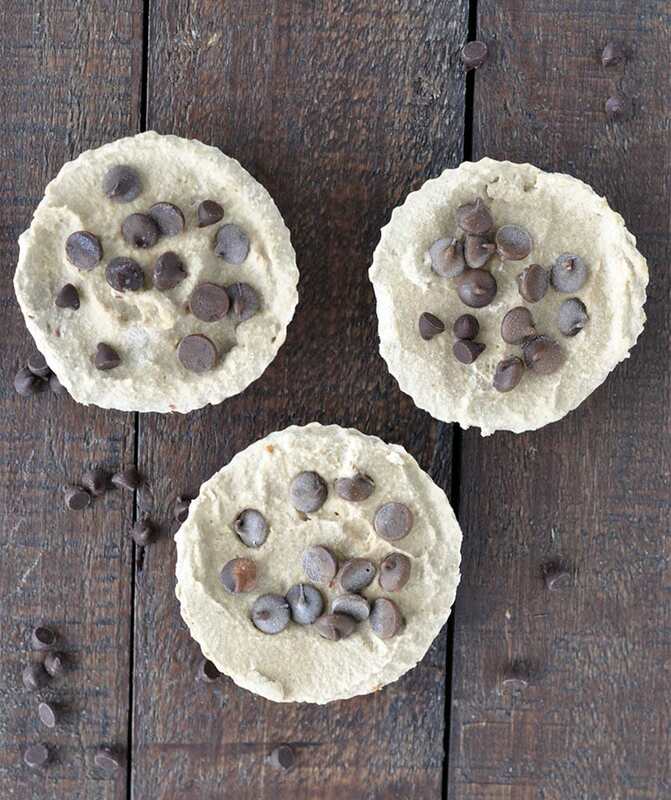 These Coffee Protein Cheesecake Bites make a healthy dessert with nutritional benefits. Vegan and gluten free. Add the almonds to a food processor and blend into a fine consistency. Then add the dates and continue to blend. Lastly add water, 1 tablespoon at a time, until a dough starts to form. 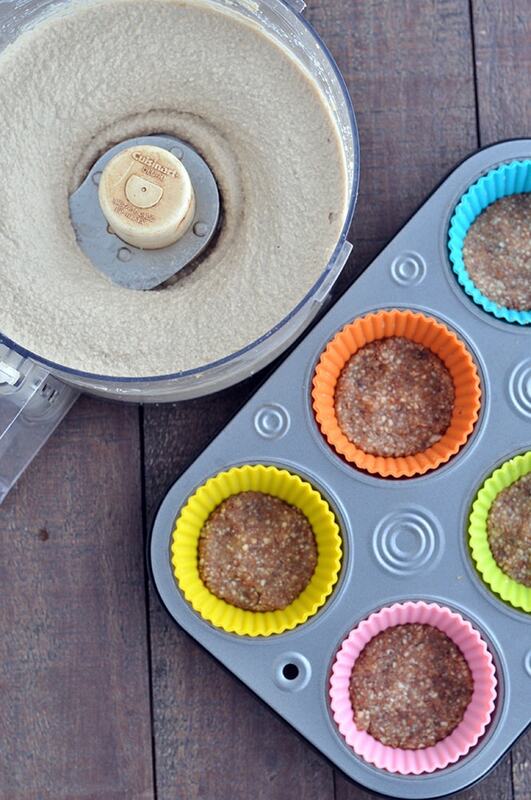 Press a little dough into each lined muffin cup. Place in the freezer while you make the cheesecake. In a food processor add all the cheesecake ingredients to a food processor and blend until smooth. Pour the mixture into each muffin cup and place in the freezer to set. If you like, you can garnish the tops of each cheesecake bite with chocolate chips. I used stevia sweetened chocolate chips in the garnish of mine. Keep these bites stored in the freezer for best results. They should last at least 6 months that way. Enjoy! Where did you purchase the Rebbl? Can you order online? According to their website there's not a store close by that I could go pick it up. I get mine at Sprouts. It doesn't look like you can order on the website right now. Can you ask your local grocery store to carry it? They sometimes will do that on request.